Here’s some new pictures that I thought you might enjoy. This first picture is taken in October of 2013 from Ampersand Mountain looking north. I had been in the area the previous weekend, and the foliage was at peak so decided that I’d come back out late Wednesday, climb Ampersand and catch the view in the setting sun. When I got there I was a bit disappointed because many of the trees were past peak (you have to be quick in the Adirondacks or they’re gone!). The view is to the north, looking out over the Lake Country between Tupper Lake (off to the west way out of the picture) and Saranac Lake (to the east). Lovely view, but the wind was actually howling so I was crouched between one rocky spur to my left and the one you see. 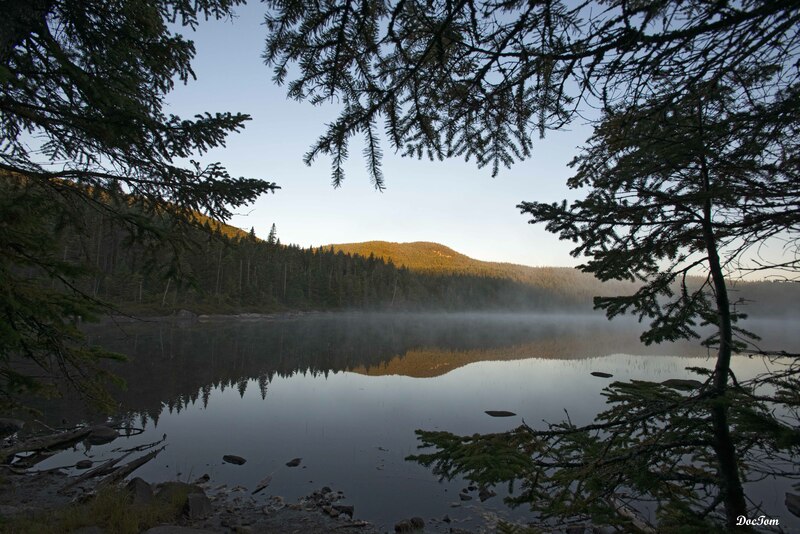 In early September of 2014 I backpacked to Wallface Ponds. I have wanted to do an overnight when the moon was full because there’s a spot off the trail that offers a beautiful view of the MacIntyre Mountains (Wright, Algonquin and Boundary) and I thought I could get a lovely shot of the moon over the MacIntyres. After setting up camp near the main Wallface Pond I headed back to photograph the MacIntyres. You can imagine my disappointment when the moon came up just too far south to make for a good picture (just being off a few degrees can make all the difference). I considered waiting for the moon to pass far enough to the west to at least allow for a good shot of the Macs in the moon light, but decided it wasn’t really worth waiting 4 or 5 hours and headed back to camp. Making my way through narrow trail and bog at night was a true joy. When I finally got back to my tent I was muttering phrases I’ll not post here. But I was thrilled to find that the moon was shedding its light almost perfectly onto the pond. 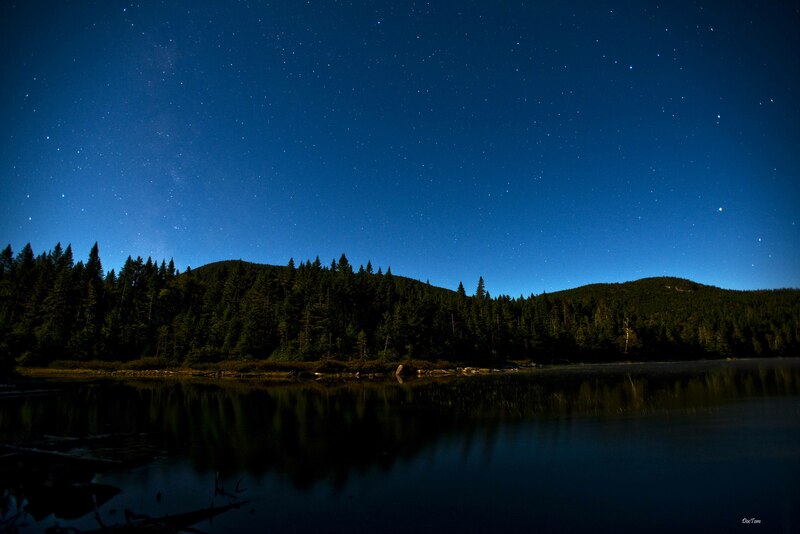 In the first picture below, the moon is just about exactly in the plane of the picture to the left, illuminating McNaughton Mountain and the pond, but also allowing for a lovely shot of the Milky Way rising up out of McNaughton. 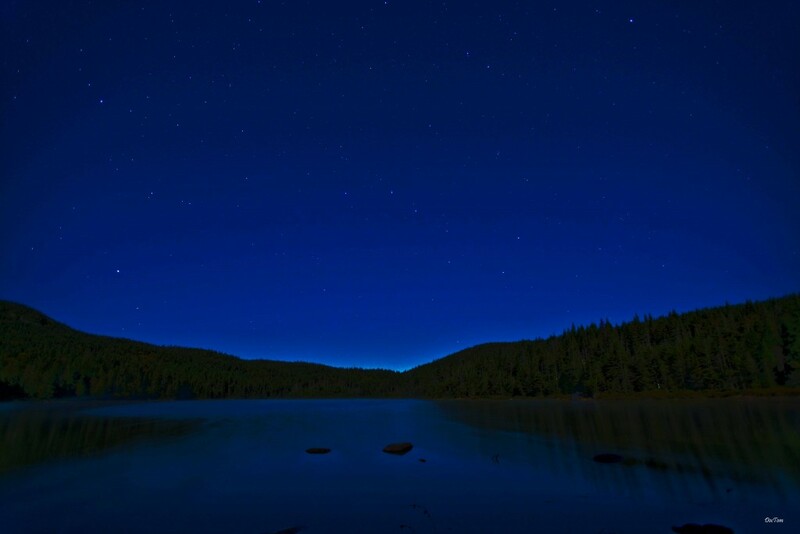 In the next photo, the moon is behind me, illuminating the pond while allowing a nice shot of the Big Dipper and the Little Dipper (near top of photo). As you might imagine, I crawled into my sleeping bag a happy photographer that night! Waking with the dawn, I was treated to the beautiful view of the pond (perfectly still) on a cool Fall morning (below). 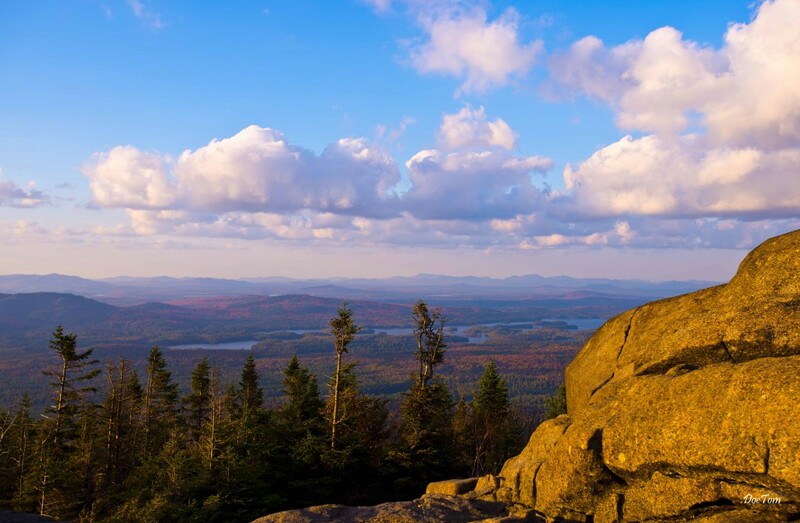 Is it any wonder that people love to hike the Adirondack High Peaks? you provide heee and сan’t wait too take a looк when I get home. I’m shocked at how quicҝ yohr blog loaded on my phone ..
am glad that you shared this helpful information with us. Please keep us up to date like this. I actually wanted to write a quick message in order to thank you for these great tactics you are writing at this site. My rather long internet research has now been rewarded with really good details to talk about with my good friends. I ‘d express that many of us readers are very much lucky to live in a very good website with very many outstanding people with very helpful ideas. I feel pretty privileged to have discovered your entire website page and look forward to some more cool minutes reading here. Thank you once more for everything. your weblog posts. Any way I’ll be subscribing in your augment and even I achievement you get right of entry to constantly quickly. Thanks for another wonderful post. Where else could anyone get that type of info in such an ideal way of writing? I’ve a presentation next week, and I’m on the look for such info. Just wish to say your article is as astonishing. The clarity in your post is simply excellent and i can assume you are an expert on this subject. Well with your permission allow me to grab your RSS feed to keep up to date with forthcoming post. Thanks a million and please carry on the gratifying work. The core of your writing while appearing agreeable initially, did not really work very well with me personally after some time. Somewhere throughout the paragraphs you actually were able to make me a believer unfortunately just for a very short while. I however have got a problem with your leaps in assumptions and you would do well to help fill in all those breaks. If you can accomplish that, I will certainly end up being fascinated. Good luck with your training and don’t give up. As someone who couldn’t make it up Phelps when I first tried (too many years at a desk job), I know how you feel. Believe me, all your hard work will be rewarded. Best wishes, and thanks for your kind comments.